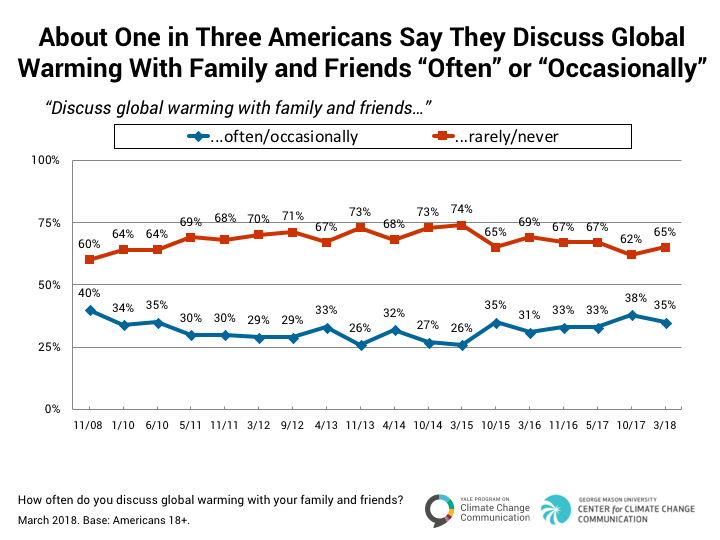 Thirty-five percent of Americans say they discuss global warming with family and friends at least occasionally, a decrease of three percentage points since October 2017. 4.2. There are many reasons Americans don’t talk about global warming with their family and friends. 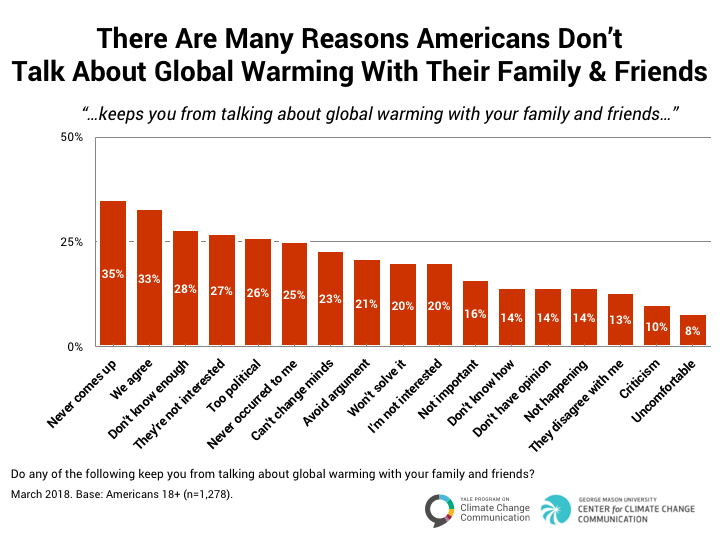 About one in three Americans say that they do not talk with family and friends about global warming because it never comes up in conversation (35%) and/or because they already all agree about global warming (33%). Fewer say they don’t talk about global warming because they don’t know enough to talk about it (28%), their family and friends are not interested in it (27%), it is too political (26%), and/or it has never occurred to them to talk about it (25%). When asked to choose the top reason they do not talk about global warming with their family and friends, Americans most commonly say that it is because they already agree about global warming (12%), they don’t know enough to talk about it (11%), that global warming never comes up (8%), and that it is too political (5%; see Data Tables). 4.3. 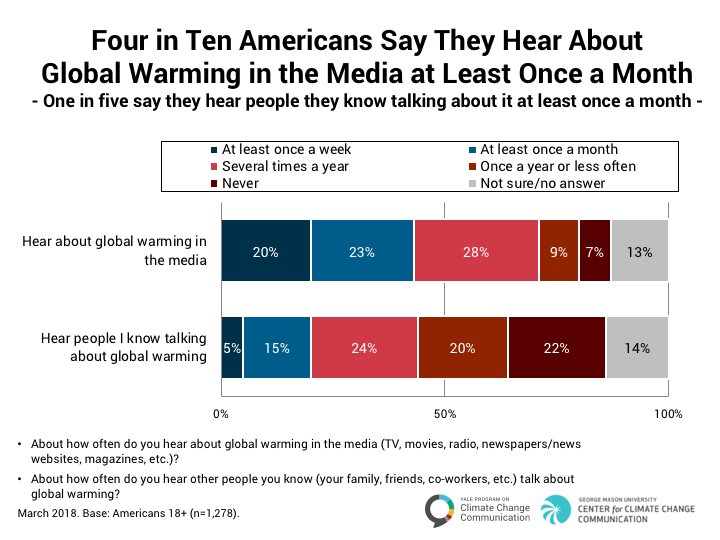 Four in ten Americans say they hear about global warming in the media at least once a month; one in five say they hear people they know talking about it at least once a month. Only about four in ten Americans (43%) say they hear about global warming in the media once a month or more frequently. More than one in three Americans (37%) say they hear about it in the media only several times a year or less, and an additional 7% say they never hear about it. Only one in five Americans (20%) say they hear people they know talking about global warming once a month or more. In contrast, 44% say they hear people they know talking about it only several times a year or less, and about one in five (22%) say they never hear people they know talk about global warming. 4.4. 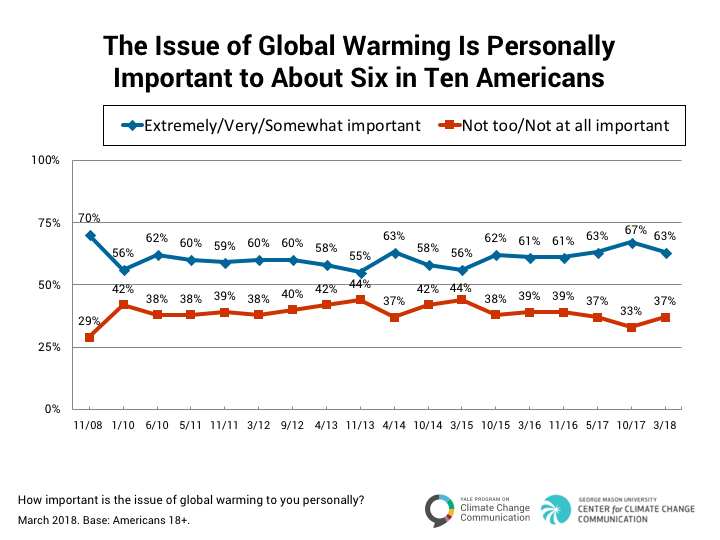 The issue of global warming is personally important to about six in ten Americans. About six in ten Americans (63%) say the issue of global warming is either “extremely” (10%), “very” (18%), or “somewhat” (35%) important to them personally. More than one in three (37%) say global warming is either “not too” (22%) or “not at all” (15%) important personally. 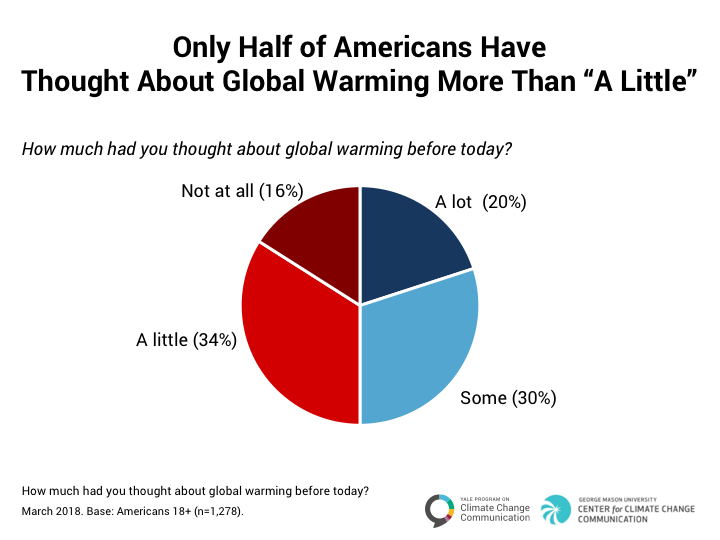 Half of Americans say they have thought about global warming before today either “a lot” (20%) or “some” (30%) and half say they have thought about global warming just “a little” (34%) or “not at all” (16%). Leiserowitz, A., Maibach, E., Roser-Renouf, C., Rosenthal, S., Cutler, M., & Kotcher, J. (2018). Climate change in the American mind: March 2018. Yale University and George Mason University. New Haven, CT: Yale Program on Climate Change Communication. This research was funded by the 11th Hour Project, the Endeavor Foundation, the Energy Foundation, the Grantham Foundation, and the MacArthur Foundation.